Recombinant Human cytomegalovirus (HCMV) Glycoprotein B /gB Protein, C-Fc Tag (rh CMV-GB Fc Chimera) Val 23 - Lys 700 (Accession # AAA45920.1) with furin cleavage site mutated from 'RTKR' to 'TTQT', was produced in human 293 cells (HEK293) at ACROBiosystems. 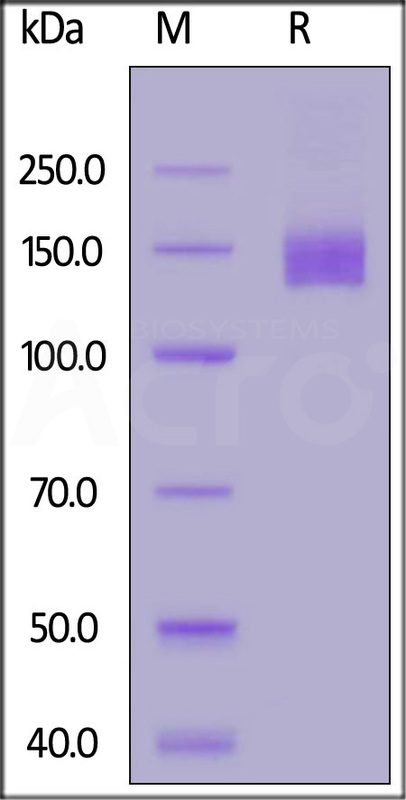 The protein has a calculated MW of 104 kDa. The protein migrates as 140-150 kDa under reducing (R) condition (SDS-PAGE) due to glycosylation. HCMV Glycoprotein B (gB), Fc Tag on SDS-PAGE under reducing (R) condition. The gel was stained overnight with Coomassie Blue. The purity of the protein is greater than 85%.